So for those who haven’t been to the Orange County coast of California, you may not be familiar with the swathe of land that covers approximately 60 miles from Northern tip to Southern tip. This swathe of land also happens to have an incredible variety of hotels from resorts such as the Rancho Valencia in the south, to the Island Hotel in Newport Beach all the way on the North. My preference has always been for the resorts on the Southern end of Orange County (Including the Ritz-Carlton in Laguna, the Monarch Beach in Laguna, or the Montage also in Laguna). However, sometimes you need to be in a particular place and don’t feel like driving an hour just to get to somewhere you need to be. 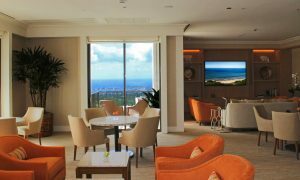 If it so happens that you need to be spending time in Huntington Beach or Newport Beach – then your best option, in my opinion, is the Island Hotel. This property isn’t particularly new, nor is it particularly flashy, but what it does have it does very well. The tone of the property is muted and beach-reminiscent. 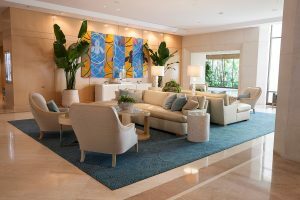 Pastel tones carry the property and make it feel light and airy and even though it is still a few miles from the Ocean one would think they were right on the beach when entering the lobby. The rooms themselves have great expansive views, as the building is exceptionally tall and although they’re not as updated as I would personally prefer, they still have a well-built luxurious quality to them and the mattresses are comfortable, the entertainment systems are updated, and bathrooms are kept exquisitely clean. 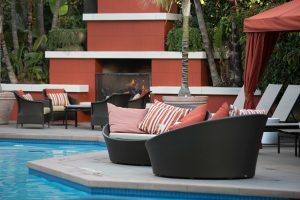 My favorite features at the hotel are the poolside fireplace – a great place to have a glass of wine and unwind for the night, and the rooftop lounge – replete with awesome views all the way to Los Angeles and of course towards the Ocean. I highly recommend checking last minute rates at this hotel, they are often pretty cheap. 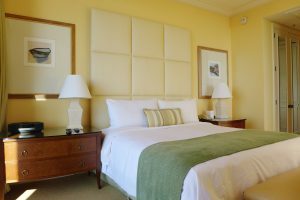 Also, you can often get a good room upgrade once you get to the hotel, the suites are pretty great bargains and are very nice – a step up from the standard accommodations and worth the extra $$.